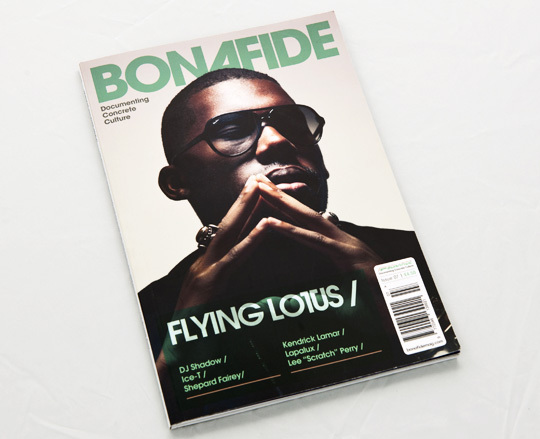 Bonafide Magazine #07 – OUT NOW! For the winter edition of the magazine Bonafide reels out the big names, in the largest issue yet, featuring in-depth interviews with Flying Lotus, Kendrick Lamar, DJ Shadow, Ice-T, Lee ‘Scratch’ Perry and divisive sheet artist, Shepard Fairey (OBEY). Bonafide staff and contributors also select their 50 Best Records of 2012, for an extensive 30 page feature. Hear from psychedelic rap project Kingdom of Fear (Jehst x Kashmere), Lapalux, the only UK based artist signed to Flying Lotus’ Brainfeeder record label and the Dutch graffiti legend turned 3D architect Delta. There is also a fashion shoot courtesy of lifestyle hub BNTL. To make it a truly immersive experience, Bonafide copy editor and in-house DJ, DJ Baboon also steps behind the ones and twos to deliver a sterling new mix featuring musicians included in the magazine.